Mike Bourdon of team Above Average Firefighters fires a shot. Polson senior Jarod Farrier rifles a shot. Ronan High Schooler Brant Heiner blocks a shot. Leigh Kenning prepares to hurl a shot at her opponent. 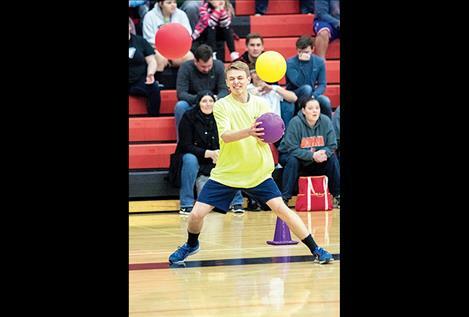 RONAN – The “Ballers” dodgeball team ducked, dived and dove their way through 24-team brackets to win the third annual Ronan Spring Sports Dodgeball Tournament Championship at the Ronan Event Center on Friday evening. 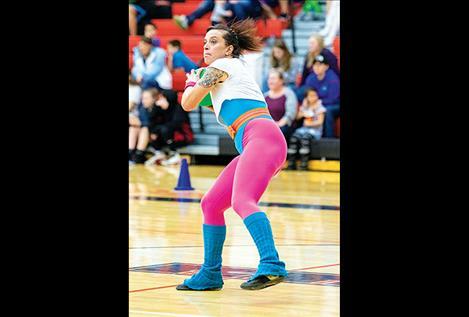 The event is billed as the “Largest Dodgeball Tournament in Western Montana” with more than 140 players participating in at least two 5-minute games. 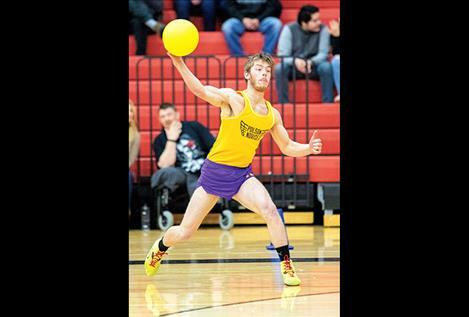 The double-elimination style tournament is held as a yearly fundraiser for the Ronan High School spring athletic program and is open to six-player teams of any skill level. 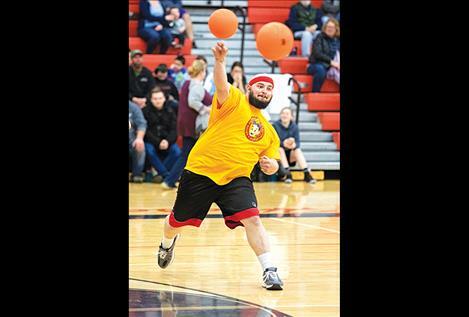 “It’s good exercise and it’s fun for everybody,” said Cody LeProwse of team Dodge Dodgy Dodgers. According to LeProwse, the team was assembled from a mix of random friends just wanting to come out to enjoy a fun evening and help support the kids in the local community. With the “Ballers” taking the championship this year, the win marked the first time in event history that a high school team won the tournament. Ronan High School students Landon Lynch, Matt Victor, Trapper McCallister and the Durheim brothers (Dallas, Elijah, and Noah) were the members that comprised the “Ballers” team. And while the crazy, fast and furious game of dodgeball may have been a lot of fun to play, the reactions of the cheering fans from the stands made it evident that it was also fun to watch. The tournament raised a little more than $2,500 for spring athletics. Funds were raised through at-the-door admission of $3 for adults and $2 for students, a 50/50 drawing and silent auction and entry fees.